first. Make sure invoices are dated later than January 1st 2019 for claims. Our infamous VP of Sales, Jeff Short, gives you the lowdown on the tire industry. Don’t worry, its filled with useful info, and even has some fun trivia contests from time to time! Click below to access the April 2019, “Thought You’d Like to Know” monthly newsletter. Like two boxers locked in a title slugfest, NEXEN and Falken have both been landing solid blows. These are two welterweight companies punching above their class. Of course they’re not true top-ranked heavyweights like Bridgestone, Goodyear and Michelin, but they are amassing solid records by by scoring important OE contracts. The latest: Falken’s Wildpeak M/T has been chosen as the official tire on Jeep Wrangler Rubicon models. NEXEN strikes back, winning O.E. on Volkswagen Jetta. Falken springs off the ropes with a counter punch to supply Subaru Crosstrek Hybrid. Sensing their prey has been stunned, Falken closes in for the knockout. With a lightning fast Nissan one-two, Falken jabs with Rogue SV and then winds up the Altima haymaker. Ka-bam! Falken wins this bout, but NEXEN went the distance. We’ll await the next announcement from our neutral corner as I’m all out of boxing cliches. In case you needed just one or two more reasons to start selling Falkens – here you go. Falken has added road hazard coverage to just about everything they sell with the exception of their RT615 road race tires and their M/T. Only tires sold after January 1st 2019 count. They’ll cover the first 3/32nds or 2 years, whichever comes first. And if you’d like to hear more about it, just buy 12 of their tires to sign up on the Fanatic program and Falken will fly you out to California, all expenses paid, for an in-depth brainwashing at the Falken Academy. Ride and drives on California Motor Speedway, off-road Jeep adventures, and some good old classroom sessions. And don’t even get me started on the extremely cool hotel they put you up at. To learn more call us at 800.732.3563, ask to talk to Brandy or Jessica! Click below to access the February 2019, “Thought You’d Like to Know” monthly newsletter. American Muscle for an American Hero! Nexen Tire gives back to the troops! 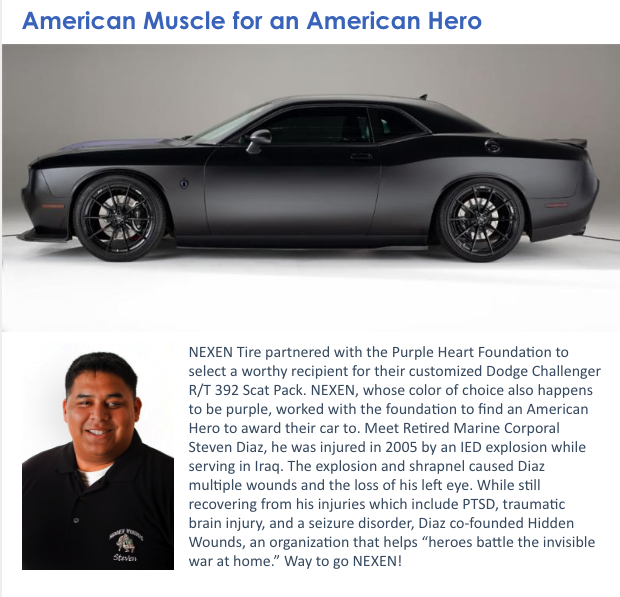 One tire manufacturer is going above and beyond to honor our American veterans…Thank you NEXEN TIRE! Whatever happened to rock stars? I didn’t have to google Dodge Ram to know what the heck it is. Some of my friends even drive them. They’re made in MICHIGAN. USA. Anyway, if you buy a 2019 Ram and spec it with the ‘4×4 off-road package’, you’ll be tooling through the mud on Falken WILDPEAK AT3W tires because they’ve earned the EXCLUSIVE O.E. contract. You get the point – this Falken company is for real. Click below to check out Jeff Short’s latest edition of industry news! It is jam packed with useful, interesting and sometimes quirky tidbits of tire industry knowledge. In the earlier part of the last century it might have been difficult for a tire dealer to envision modern tire designs. But the techniques used to sell them haven’t changed much. In the November 1919 issue of Tires (which later became Modern Tire Dealer), an article appeared titled “Fourteen Points of Salesmanship.” It was written by R.E. Wilson, assistant instructor of the Traveling Sales schools of the Goodyear Tire & Rubber Co. The No. 1 item on the list? Knowledge. The list is like a time capsule. It outlines what mattered in the tire industry 93 years ago. Its truths still ring true today. 1. Knowledge – Probably the most important requisite the buyer expects of the salesman is that he should know thoroughly about the goods he is trying to sell and be able to answer questions. Spare time should be spent studying and gathering together all possible information. 2. Sincerity – It is of the utmost importance to convey the impression of sincerity. Personal conviction is the first step in convincing another of the proof of a statement. It is first necessary to thoroughly sell oneself to be 100% efficient in selling others. 3. Impressio – A proposition stated in clear and concise manner without undue emphasis upon entertaining conversation relative to the weather, brand of cigars smoked or results of the ball game, will quickly give the prospect a clear understanding of the situation outlined to him. 4. Appearance – A pleasing appearance is of fundamental importance. Owing to the importance of first impressions, a distinct advantage is gained by being well-groomed, but not over-groomed. 5. Buyer’s Name – One of the first factors entering into successful selling is the ability to remember the name of the person with whom one is talking. 6. Arguments – It is more diplomatic to emphasize the points of agreement and show a man wherein he is right than to show him where he is wrong. 7. Promises – A promise broken, even though a small one, creates an impression of undependability. An appointment made for 8 o’clock in the morning should mean 8 o’clock and not 8:05. Where unavoidably detained it is much the wisest course to wire the reason for the delay. 8. Optimism – To radiate optimism rather than pessimism is oftentimes half the battle. One must have a thorough knowledge of products and policies and be familiar with the most scientific methods of merchandising. He must believe in what he sells. 9. Dangerous Words – Unfamiliar words can damage the success of a sale. Express in clear and simple language. Don’t try and demonstrate superior education. 10. Exaggeration. – State facts convincingly and exactly as they are. Exaggeration discounts a statement and discounts the man making it. 11. “Cheap.” – Cheap can mean of low value as well as low-priced. Eliminate this word from your vocabulary. 12. Overloading. – Sell customers the goods which are best for him to buy or he will feel your only concern is to sell him something. A salesman’s first business is to sell goods, but he must be shrewd enough not to jeopardize all future sales by overloading. 13. Underloading – It is important not only to sell, but to show in turn how to dispose of what has been purchased. It is possible to materially increase business by making it a policy to be careful as to the kind and amount of stock sold. 14. The “You” Attitude. – Convince the prospect that your proposition is to his interest. If there must be any patting on the back, at him – not yourself – because he and he alone is the man who can place the order. 1. You need to make sure that your advisors are well trained when they pick up the phone. In far too many cases low car counts are because the advisor(s) is either the wrong person, is not properly trained, or isn’t being held accountable by the shop owner. Having clearly defined car count goals, recording all the calls, and discussing the lost calls are all keys to your success. As an added note, at Elite we have seen dramatic increases in car counts when shop owners do nothing more than record the calls, and the reason is obvious: When employees realize they are being monitored, that in itself improves their performance. 2. Call those customers who have recently declined repairs. However, in doing so you need to be careful about who you call and how the calls are presented. Any customer who failed to authorize a repair or service that poses a safety risk to the driver, needs to be called. Although there are exceptions to every rule, I would strongly recommend that you call these customers within one week. The call doesn’t need to be a “sales” call, but merely a call to let the customer know you are concerned about their safety and well-being. If it’s a first-time customer, you can simply let them know that you are following up to see if they’ve have had the chance to have the repair done since they left your shop, because regardless of where it is done or by who, you just want to ensure that the recommended repair wasn’t forgotten, and that they are safe. 3. Call those regular customers who you haven’t seen for a long time. Let them know you couldn’t help but notice they haven’t been in for quite a while, and then simply say something like… “Do you mind if I ask, did we somehow drop the ball?” The answers that you hear will be priceless. In some cases you will hear that they bought a new car, and you’ll be able to let them know you can service their new vehicle as well. You may hear that you or your employees did drop the ball, and if that’s the case, you can apologize, make things right, and offer them a complimentary service to show them just how sincere you are.